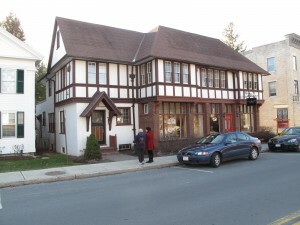 This Tudor Revival style building has two stories, an asphalt shingle roof, and is intact. This structure has 5-bay, brick & wood framed construction and a hipped roof with shed-roofed dormers. There is brick cladding on the 1st floor laid up in English bond with stucco with half-timbering on the upper story, and wood shingles on the dormer sides. The articulated 2nd floor overhangs the front façade, and is supported by large wood brackets with sets of 3 windows flanking a center bay w/4 windows – all 4-o-4. There are leaded 12-light transoms over 3-part storefront windows. The recessed Left side ell has a gable roof which is 2-bays wide & has a steeply pitched canopy over the entry to the 2nd floor. The door has 3 vertical panels with decorative wood graining and a 6-light leaded glass window; pent between the 2nd floor and the attic level in the Left side ell. There is a 1-story rear ell and a rear wall chimney between the main house and the rear ell. The foundation is concrete. This building was built as a combination commercial and residential structure, with retail space on the first floor and an apartment below. In 1918, it housed an antique shop and the first Lenox savings Bank, with the owner of the building, Leonard C. Peters, residing upstairs. The Peters family has retained ownership of the building, and although the businesses have changed the commercial/residential mix has stayed the same. Eventually the antique shop was replaced by a medical office, and in 1957/8 the bank and medical office were replaced by Talbot’s Dress Shop. On July 31, 1979 Talbots The, Inc. took over ownership.